Farewell to our Caption Reto Ruesch and whole Heli-Linth Family! – Summit Helicopters Pvt. Ltd.
Heli-Linth is one of the helicopter company based in Mollis, Switzerland. There is a special relation between Heli-Linth and Fishtail Air. 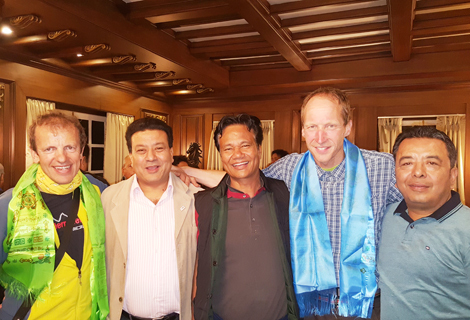 Caption Reto Ruesch and his team members arrived Kathmandu on 2nd April 2017 for Everest area trek. They stayed here for more than two weeks in Nepal. During those days, Capt. Reto flew flawlessly over Everest Region with our AS350 B3e (9N-AJQ). Caption Reto and his team were invited by our chairman Bikash J.B Rana in his residence on 23rd April, 2017 for farewell party. Fishtail’s members were there to say goodbye to Heli-Linth team. Fishtail Air thanks them for their wonderful support and contribution. They departed from Kathmandu on 24th April for Switzerland. Fishtail will be looking forward to have more good relation with Heli-linth in coming days. Posted in: Company News, Tourism Articles.